Old media, trumped once again. You’d think they’d learn at some point. Over the last few weeks I have tried to make you aware of the growing threat that ISIS poses to our nation. Today, I wanted to reach out to you regarding what I believe to be the most vicious part of ISIS and that is how they using children. A few days ago, ISIS put out a propaganda video of a minor shooting an individual they claimed was an Israeli spy. These children are being brainwashed and young men as little as 13 have been killed fighting for ISIS. One propaganda video had a 7 year old kid holding up a severed head, while another video has a boy who appears to shoot two men in the back of the head…. This week new attacks by ISIS in Tunisia and Yemen showed new capabilities by the terrorist organization to attack on multiple fronts. In Yemen, ISIS took credit for the bombing of 2 mosques in which 143 people were killed and 351 people were wounded. ISIS then put out a statement that pledged this would be the first of many attacks on Yemen. This attack came after 21 people were killed in Tunisia during an attack at a national museum…. The sectarian violence that is occurring at the hands of ISIS is creating a humanitarian crisis. Nearly 4 million Syrian refugees are living in Egypt, Jordan, Lebanon, Turkey and Iraq. While another 6.5 million Syrians have been displaced from their homes. That means nearly half of Syria’s pre-war population has been displaced. I would ask you to consider a contribution to humanitarian groups, such as the Red Cross or Samaritan’s Purse to help in this effort…. Fordham Law School’s Center on National Security has released an interesting study that reviewed court records over the last two years in regards to Americans that have been arrested for aiding ISIS. It seems that these individuals were seeking to build an Islamic State or a Caliphate right here in the US. While this alone is eye opening, don’t forget that National Intelligence Director, James Clapper said last month that over 180 Americans have travelled to Syria to help ISIS…. As you are probably well aware FBI Director James Carney came out last week and stated that there are thousands of ISIS followers in the United States. ISIL has also taken claim for the shootings that took place in Texas earlier in the week. What is more concerning is that all of our bases as of Thursday night are at Force Protection Bravo…. Despite months of US airstrikes and gains made in northern Iraq, ISIL has captured the city of Ramadi, the capitol of Anbar Province. Ramadi is just 70 miles from Bagdad, putting the terrorist organization in striking distance of the Iraqi Capitol…. If that’s not a drum beat I don’t know what is. That’ll motivate her base if they’re not already hiding under their beds. 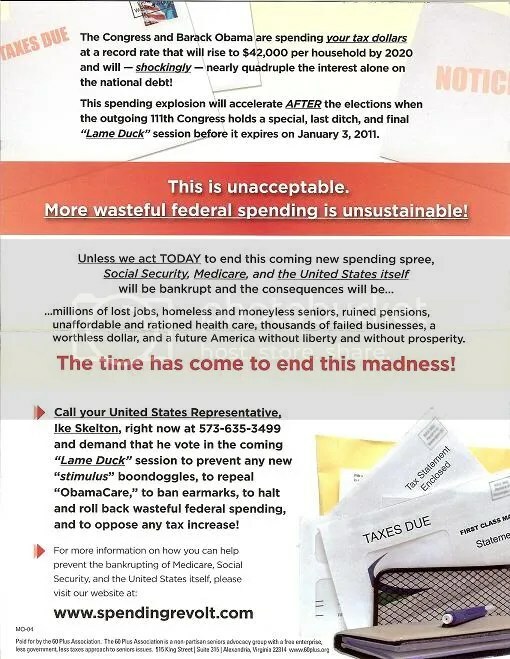 More scare tactic campaign mail from an astroturf right wingnut corporatist organization. The address side of the mail piece. 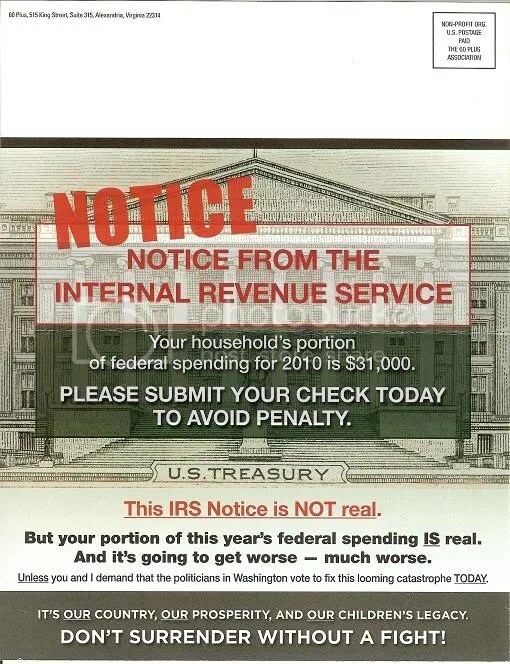 This IRS Notice is NOT real. That defeats the whole purpose of the mailing, doesn’t it? If it’s not real than you shouldn’t be afraid of it. The back side of the mail piece. Ah, it’s directed at Representative Ike Skelton (D). Wrong. They have that much contempt for people in Missouri’s 4th Congressional District – they think voters are stoopid. Here’s the rich part – this astroturf group isn’t concerned about preserving Social Security. In fact, they have been advocates for privatization. ….Every year since 1984, Social Security has collected more in payroll taxes and other income than it pays in benefits and other expenses. (The authors of the 1983 Social Security reform law did this on purpose in order to help pre-fund some of the costs of the baby boomers’ retirement.) These surpluses are invested in U.S. Treasury securities that are every bit as sound as the U.S. government securities held by investors around the globe; investors regard these securities as among the world’s very safest investments. Investing the trust funds in Treasury securities is perfectly appropriate. 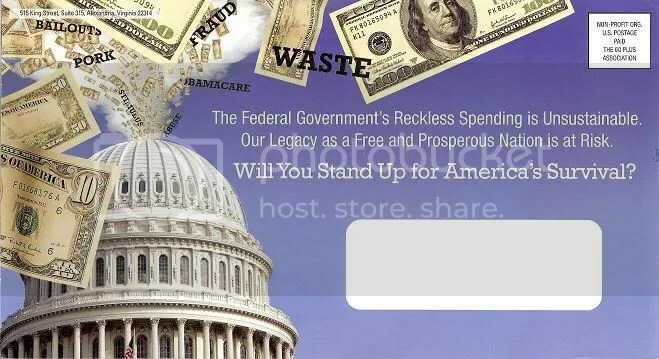 The federal government borrows funds from Social Security to help finance its ongoing operations in the same way that consumers and businesses borrow money deposited in a bank to finance their spending. In neither case does this represent a “raid” on the funds. The bank depositor will get his or her money back when needed, and so will the Social Security trust funds. This is the consequence of Citizens United v. Federal Election Commission (No. 08-205) – astroturf right wingnut corporatist organizations can spend unlimited amounts of money to pervert our elections, and because obstructionists in the republican minority carry water for them, these organizations don’t have to divulge who is bankrolling them. The 60 Plus Association, a pharmaceutical industry front group, claims it is a “nonpartisan senior advocacy group,” but it really operates counter to elderly citizens’ best interests. 60 Plus advocates positions on issues that benefit big corporations but that stand to harm seniors…. The “60-Plus Association” was AstroTurf before AstroTurf was cool. These kinds of right wing phony groups are a dime a dozen now. 60-Plus is a DC outfit mostly made up of longtime Republican operatives that pretend to be concerned about senior issues. In reality they appear to exist for little more than to help Republicans win elections and to scare the elderly…. Some of that question was answered when AARP hired an independent investigator to thoroughly research the phony group and they found that the pharmaceutical industry is actually paying a lot of the bills. The report revealed that in 2001 alone, 60-Plus got hundreds of thousands of dollars from some of the following: the Pharmaceutical Research and Manufacturers of America (PhRMA); drug companies like Merck, Pfizer and Wyeth-Ayerst, and even from Hanwha International Corp.; which is the U.S. subsidiary of a Korean conglomerate with chemical and pharmaceutical interests. For this reason a Public Citizen report described 60-Plus as being part of “PhRMA’s Stealth PACS” [pdf]. [AARP Bulletin Today, “Pulling Strings from Afar”, 2003]…. The irresponsible bureaucrats and politicians in Washington are bankrupting our Social Security, our Medicare, and our nation at a record speed. The consequences of this reckless and uncontrolled spending spree are clear: An economy handcuffed by uncertainty, millions of lost jobs, ruined pensions, unaffordable and rationed health care, thousands of failed businesses, a worthless dollar, and a future America without liberty and prosperity…. 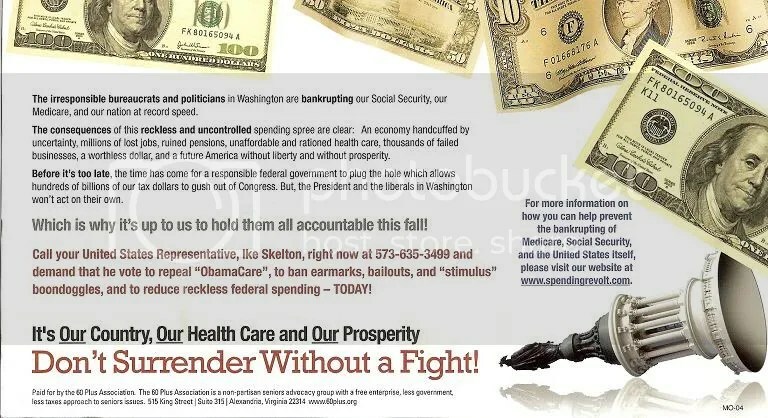 ….call your United States Representative, Ike Skelton, right now….and demand he vote to repeal “ObamaCare”, to ban eramarks, bailouts, and “stimulus” boondoggles…. …It’s Our Country, Our Health Care and Our Prosperity…. Really, they claim to be defenders of Social Security? How’s that privatization thing working out for you? You know, investing it in the stock market so people running high risk schemes can bankrupt you. And, as if dubya’s administration didn’t exist from 2001 to 2009? Let’s see the TARP bailout occurred under which president? Uh, dubya. Nope, it’s the corporations’ country, it’s the insurance companies’ health care, and it’s the top one percent’s prosperity. The rest of us only get to live here.